TV news has long since surpassed the excesses that seemed far-fetched in Paddy Chayefsky’s “Network” almost 40 years ago. Indeed, what’s shocking about Dan Gilroy’s “Nightcrawler” is how not shocking it is – while still being a rousing and visionary piece of work. In depicting the world of local TV news in Los Angeles, Gilroy has created a kinetic joyride that surfs a giddy wave of dark wit and intelligence. 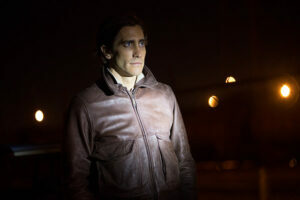 The film lives and breathes through Jake Gyllenhaal and the spookily energized antihero he brings so vividly to life. In this twisted era of the perpetual news cycle, “Nightcrawler”’s story of a bottom-feeder who rises to the top is a piece of sharp-eyed media criticism, disguised as the one of year’s most intense and entertaining films. Gyllenhaal plays Louis Bloom, first seen stealing and selling scrap metal to a man who he then asks for a job. After offering to take an unpaid internship if it will get him in the door, Lou is barely fazed when the man says, “I’m not going to hire a thief.” Point taken, Lou’s smile seems to say. On his way home, he spots the aftermath of an accident on the L.A. freeways and stops to watch the police rescue a passenger. He is amazed when a van pulls up and a scruffy team of freelance cameramen pile out to film the rescue. “Will this be on TV?” Lou asks as they rush off to another call blaring from their police scanner. Thus, an idea is born: Lou will become one of these nightcrawlers, freelance videographers prowling the streets of the city late at night, supplying local L.A. TV stations with gruesome footage of car accidents and violent crime just in time for the morning news.